The origin of Beguine is bound to remain unknown, if “unknown” means that no answer exists that makes further discussion useless. No doubt, the color gray could give rise to the name. If it were not so, this etymology would not have been offered and defended by many scholars. But, as a rule, such names develop from terms of abuse (see also Stephen Goranson’ comment). I would also like to refer to pattern congruity, though in etymology it is a dangerous tool. The three words—beggar, bugger, and bigot, as well as bicker—sound alike and refer (at least the nouns do) to the same semantic sphere. To be sure, one can string together deceptively similar words that do not belong together and get wrong results. For example, the name of the protagonist in one of the most famous Icelandic sagas is Grettir. Several episodes in the saga (and even the wording) have unmistakable analogs in the Old English poem Beowulf. For this reason, Grettir and Grendel have sometimes been compared. Yet the comparison is not feasible. So to repeat, the question remains open; as usual, we are dealing with probabilities. I only hope that the picture I have drawn is not fanciful. As for the medieval Bulgarians, I think they are called Orthodox in the loosest sense of the word, that is, “not belonging to the Roman Church.” The word Beguine is Old French, and the chance of a German feminine suffix having been appended to it is vanishingly low. Nature, they say, does not tolerate void. The language of the young is full of empty holes, and it is amazing or, conversely, depressing or pathetic (chose your favorite buzzword) to observe how desperately kids try to fill them. In the capacity as a committee member I have recently looked through several hundred evaluations students at my university, from freshmen to seniors, write at the end of the courses they take (different departments, various majors, most diverse subjects). My colleagues have been praised in many ways, and it is the subtle (another buzzword) choice of epithets that impressed me most. Everybody around turned out to be awesome, just awesome. Those students who were truly overwhelmed and whose vocabulary was more nuanced wrote awesome! and awesome!! Even awesome!!! turned up once. A single fly in this awe-inspiring ointment was the writers’ predilection for calling their instructors “proffesors,” though perhaps, when one is in love, the overall number of letters in a word matters more than their distribution. The next most frequent words in the evaluations were passionate and fun. Students really enjoyed the passion for the subjects we profess and really found some of us to be helpful, especially those who are fun professors ~ proffesors, that is, the numerous “fabulous” teachers “who made it fun” or “super fun,” for, if you provide fun throughout the semester, along with occasional food and constant feedback, the students will really and “definately” miss your course “alot.” Not to be forgotten: If the assignments are clearly “layed out,” you may be called a fantastic dude or the coolest guy ever. Foreigners complain that the vocabulary of English is almost impossible to master. They don’t realize how much can be said with very few words and that young native speakers of English find the best literature in their language so hard that they can no longer read it. Publishers cater to them and bring out books containing only the vocabulary they are able to understand, so that, to quote a perennial classic, there begins a regular competition for stupidity, with everyone trying to look even more stupid than they really are. Are toys “us” or “them”? A good title for a thriller in the spirit of Gogol: A Person and Their Nose. Their (the person’s, the Nose’s, and collectively) problems are many. The mood of the stories are gloomy. Under this title, borrowed from a student paper, I occasionally quote examples of the ineradicable rule of American English that says: “Make the verb agree with the noun next to it.” In a story of the missing plane, the Associated Press informs its readers that “[a] string of previous clues have led nowhere.” Let no one tell me that string is a collective noun. Not in this case! I have noted in the past that the use of the agreement as in the mood of the stories are gloomy is so pervasive that one may state the rise of a new norm in American English (I don’t know how “new” it is). This is the way of language change. For example, at a certain moment, the people who have no trouble distinguishing between he and him feel at a loss when it comes to who and whom and begin to say the doctor whom we believe saved the patient. Editors and teachers fight the trend but soon they too forget what is right and what is wrong, and the more advanced (“popular”) usage takes over. Here is an example of illogical syntax, which, if I am not mistaken, has won the day. “As a pediatrician, your editorial resonated with me,” “As an undergraduate, Prof. X showed me her handout,” and “As a valued ***customer, we have important news for you about….” I can stomach the first sentence (“I am a pediatrician, and the article has resonated with me”), but Nos. 2 and 3 strike me as nonsense: Professor X did not show the writer her handout when she, the professor, was an undergraduate. Nor is the company a valued customer. But as, among other things, means “when,” so that instead of saying “When I was an undergraduate, Professor X… showed me…,” people cut corners and say “As an undergraduate, Professor X….” Fortunately or unfortunately, the world goes its way without caring about teachers’ opinions. Change is natural (otherwise we would still be speaking Proto-Indo-European, which would be a catastrophe for historical linguists), but some sentences are so awkward that hardly anyone will like them: “I am an unwavering advocate of greater student participation in and control of student fees….” Well-meant but ugly. My winter gleanings are over. I congratulate our readers on the coming of spring. Please send more questions and comments. In spring everybody and everything wakes up. 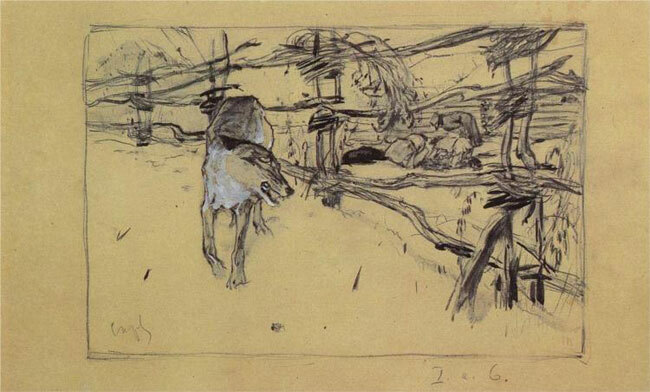 Image credit: The Wolf and the Shepherds by Valentin Serov, 1898. Public domain via Wikipaintings. The spelling proffessor is quite rational, since the first o, though reduced, is short and as such should be followed by a doubled consonant. I note that Hartmann’s Law (also known as Skitt’s Law, McKean’s Law, and the Iron Law of Prescriptive Retaliation) has struck: you write “Processor X” for “Professor X”. At your request, I shall not tell you that string is a collective noun here. Nevertheless, it means ‘sequence’ and sequence, like number is often treated as plural in this construction. As for as, note the difference between I am writing to you as the mayor of Podunk, which is slightly ambiguous about which of us is the mayor, and As the mayor of Podunk, I am writing to you, which historically has not been. The as-phrase normally applies to the nearest NP, whether it is placed before or after it, but this interpretation may be overridden by context, which normally makes it quite clear who is mayor and who is not. I rilly rilly enjoyed this one! !